After millions of years of ice ages, the Arctic has become a vast repository of fossil carbon. Over the millennia, layer after layer of carbon-based biological material has been locked away in the frozen soil of the Arctic tundras and sea beds. Some of these stores have simply become entombed within the ice. Others, already turned to methane through the slow fluxes of time, underlay the frozen ground and the chilly Arctic sea-bed floor as a kind of fire ice. An unstable, flammable, and explosive substance called clathrate. Sophie Lewis is a Research Fellow at The Australian National University node of the ARC Centre of Excellence for Climate System Science. Sarah Perkins receives funding from the Australian Research Council as a DECRA research fellow. 2013 was Australia’s hottest year on record, but how much of that was due to human-caused climate change? Today scientists publish five research papers that reveal the extent of human influence on Australia’s extreme climate conditions in 2013. The papers are published in the latest issue of the Bulletin of the American Meteorological Society. These new, comprehensive analyses show that people didn’t just leave fingerprints on the record-breaking heat: we left a clear handprint. In Australia, 2013 was a year of extremes. Throughout 2013, temperature records were broken regularly and by ever-increasing margins. Unusual heat started in mid-2012 and persisted throughout 2013. On January 7, we experienced our hottest day on record — 40.3C — as we sweltered under a “dome of heat”. January ended up being the hottest month on record, and the 2012-13 summer was the hottest recorded for the nation. Later in 2013, the nation-wide temperature record set for the month of September exceeded the previous record by more than a degree — this was the largest temperature anomaly for any month yet recorded. High spring temperatures were also associated with early bushfires in NSW in October, and severely dry conditions in parts of eastern Australia. Averaged across the whole continent, 2013 was the hottest year since the Bureau of Meteorology records began over a century ago in 1910. However, these exceptional events alone do not reveal why we experienced such severe conditions. Natural variability always plays an important role in the occurrence of weather and climate extremes. Could our exceptional 2013 heat simply have resulted from natural climate variations? Or was something else contributing to these record-breaking temperatures? 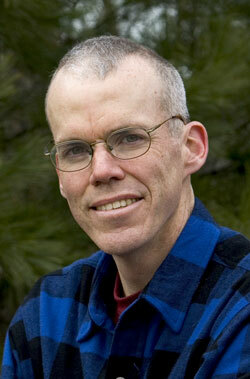 Climate scientists often talk about the human fingerprint on the climate system. These are the sometimes-subtle changes we are currently observing in the climate, beyond the simple changes in global average temperatures. The new studies published today show that people’s influence on the record-breaking heat of 2013 was anything but subtle. Each scientific paper in this issue delves into the causes of a particular aspect of 2013 extreme climate events, with the aim of identifying if human influences played a role. The extreme Australian heat held a considerable focus, with five out of the 22 papers analysing various record-breaking heat events from 2013. The individual studies can be accessed through the journal website here. The first study led by Sarah Perkins from the University of New South Wales focused on Australian heat during the 2012/13 summer by investigating two measures of heatwaves. These are the total number of heatwaves and the hottest day occurring during a heatwave during that summer. Despite heatwave frequency measuring much more “extreme” than heatwave intensity for this season (there were more heatwaves than we’d expect, but, at the continental scale, they weren’t the hottest we’ve had), a human signal was found in both heatwave measures. Human activity, through increased greenhouse gases, increased the likelihood of heatwave intensity and frequency by twice and three times, respectively. The second study led by Julie Arblaster from the Bureau of Meteorology examined the 2013 record high September maximum temperatures over Australia. September marked the peak of the record warm period that began right back in mid-2012. This study found that record September temperatures arose from a combination of complex factors. An unusual atmospheric circulation pattern occurred to the southwest of Australia, coincident with an unusually warm and dry land surface. A significant human fingerprint in the warm surface conditions was clear – anthropogenic climate change also played an important role in the record Australian temperatures in September 2013. The third study led by Andrew King at the University of New South Wales focused on both the record temperatures and the ensuing drought that set in across much of eastern Australia in 2013. Has the risk of hot and dry years such as 2013 increased due to human-induced climate change? This found the extreme heat was caused by both very dry conditions over the interior of the continent, and anthropogenic warming. The combination of extreme heat and drought conditions across Australia very likely increased by at least seven times due to climate change. In the fourth study, Sophie Lewis and David Karoly from the University of Melbourne investigated the annual temperature record of 2013 for the whole of Australia. They examined both natural and anthropogenic factors as possible causes. The record-breaking temperatures experienced in Australia fall entirely outside the bounds of natural climate variability estimated using a suite of state-of-the-art climate models. This means it is virtually impossible to reach such a temperature record due to natural climate variations without warming from greenhouse gases. This result was confirmed independently by the fifth study from Thomas Knutson at the US National Oceanic and Atmospheric Administration. While both natural climate variability and global warming contribute to recent temperature records, anthropogenic global warming made a crucial contribution to our 2013 extreme temperatures. Together, these papers provide a comprehensive answer to the question of what caused these records. They show there are multiple lines of evidence that climate change is already having a significant impact on Australia. Climate change is already increasing the likelihood of heatwaves occurring in Australia and the temperatures we experience during these heatwaves. 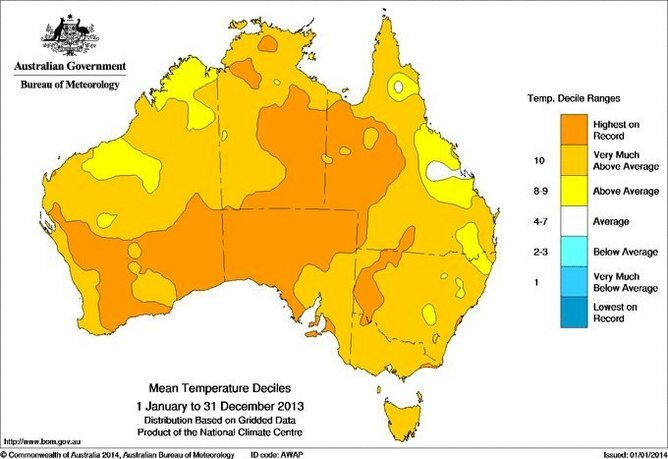 Extremely hot months, seasons and years are already more likely in Australia. This human handprint will likely increase the future risk of extremely warm days, months, season and years in Australia. We will likely also see an increase in the risk of heatwaves and dry conditions acting in combination with heat to produce drought. These five studies give us insight into our climate future. 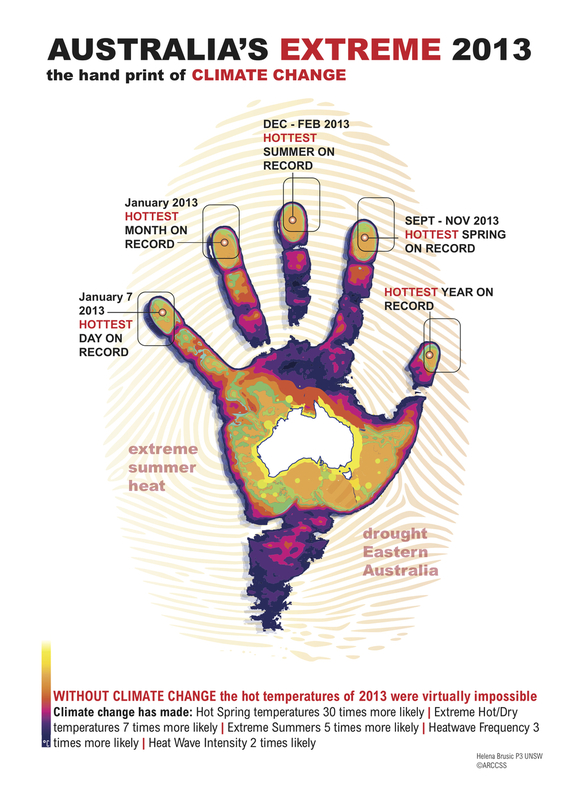 As the climate warms even further with increasing greenhouse gas concentrations, the human handprint on Australia’s climate extremes also grows larger. But should we care? Heatwaves are associated with costly and devastating impacts not just on the environment but also for human health, infrastructure and agriculture. They cause the greatest number of deaths than any other natural disasters in Australia. Hot months and seasons are important risk factors for the occurrence of severe droughts and for bushfire weather, posing considerable threats to our food and water sources, property and natural environment. In order to reduce the serious impacts of more frequent and more severe heat, we must reduce greenhouse gas emissions, and we must adapt to the changes already set in motion. This coincided with a fall in the polling for the abbott** Government. The result has been a slight return from extreme unpopularity to mild unpopularity in that polling. News Ltd and consequently all journalists who hope one day to be within that august stable of fearless reporters and commentators have wiped the Budget not only from the front page but also from all the inside pages of our newspapers. “We have undergone a transformation during the last few decades—what John Ralston Saul calls a corporate coup d’état in slow motion. We are no longer a capitalist democracy endowed with a functioning liberal class that once made piecemeal and incremental reform possible” writes Hedges at TruthDig. The old liberal class, the safety valve that addressed grievances and injustices in times of economic or political distress, has been neutered. There are self-identified liberals, including Barack Obama, who continue to speak in the old language of liberalism but serve corporate power. I think everybody on the panel supports them, including the Flood Wall Street event that I know Naomi and I will be at on Monday morning. We have to understand that the corporate state, including the Democratic elite, will react the way all calcified states react. They will use the security and surveillance apparatus, they will use military police forces and, under Section 1021 of the National Defence Authorization Act, the military itself, to violently shut down dissent by force. We saw it in Occupy, the legal and organizational mechanisms that are now in place to, with the flip of a switch, put this nation instantly under martial law. And when acts of mass civil disobedience begin on Monday, including with Flood Wall Street, and later Occupy the UN, I am almost certain that the face of the corporate state, as it did during the Occupy movement, will reveal itself. If the response of the corporate state is repression rather than reform, then our strategy and our tactics must be different. We will have to cease appealing to the system. We will have to view the state, including the Democratic establishment, as antagonistic to genuine reform, and we will have to speak in the language of overthrow and revolution. Are the gloves finally coming off? Will people revolt against the corporatacrocy? I also found it interesting that whilst the panelists’ hears are all the right place, they still live in the ignorance of what the future holds. Naomi Klein, whom I mostly admire, don’t get me wrong, spouts “how are we supposed to respond to a crisis that requires that we invest massively in the public sphere, when all we hear is that we have to cut back, when we need to invest massively in public transit? So we know what to do, but we are locked within an ideological system that tells us that we can’t.” She wants austerity to end……. Hello? Austerity is the only thing the future holds. But I wonder if he realises just what sort of pain is coming. I doubt that he thinks a whole lot of people will end up starving and without solar panels to keep their lights on and the beer cold. We certainly live in interesting times…. by Kari McGregor, co-founder of the Australian grassroots non-profit, Sustainability Showcase, where she manages various degrowth-oriented projects. 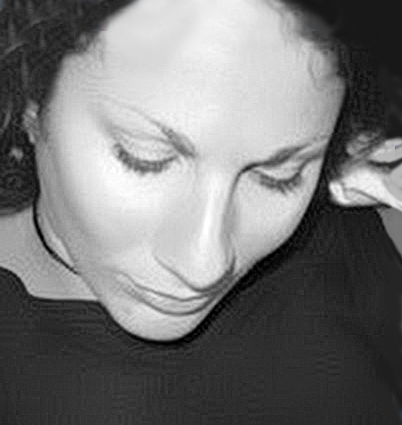 Kari is also editor of SHIFT magazine, an independent advertising-free magazine that provides a platform for voices of the degrowth movement and deep ecology. A committed downshifter herself, Kari devotes much of her time to volunteering for the movement, and is a passionate environmental activist. I’m sure you’ve heard that everyone – or, at least, everyone who cares – will be marching for the climate this weekend. If you’re not marching, then you’re not doing anything at all, or so we’re told. False dichotomies aside though, I won’t be marching this weekend. I’ll be taking action instead. 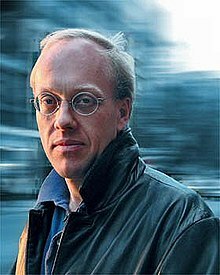 I agree with Chris Hedges: the march is nothing more that street theatre. It won’t lead to any policy changes; it won’t wave a magic wand over corporate ecocide; and it sure as hell won’t get middle-class white folk to give up their privilege and downshift. It will be a colourful (well, mainly blue t-shirts) climate-themed street parade, complete with back-slapping and high-fiving over how amazing the climate movement is for managing to get so many people outside on a weekend for a stroll around a city. Here in Australia we’ve watched the situation go from bad to worse in the year since we elected the worst of all possible governments to power. To say Australia lacks the political will to address ‘the greatest moral and social challenge of our time’ is to state the obvious. Instead of being shocked, perhaps our response should be disgust, followed by action. We should be disgusted by the scrapping of the Climate Commission, the repeal of the carbon tax and mining tax, and the removal of funding for the Environmental Defender’s Offices. The irony of these backward steps, taken while greenhouse gas emissions are increasing faster than at any point in the last three decades, should not be lost on anyone with a finger on the pulse. For all our polite letter-writing campaigns and clicktivist petitions, for all our colourfully theatrical street rallies, these policy backslides are evidence that this government doesn’t give a damn what ‘we the people’ think, or want. They’re not intimidated – they know there’s no ‘or else’ clause in any of those letters or petitions. They know the rallying troops will never threaten direct action, or show up on their doorsteps to demand action. Approvals for mega-mining projects in Queenland’s Galilee Basin – including the largest coal mine in Australia, Indian company Adani’s Carmichael mine – and for dredging and dumping on the Great Barrier Reef are a poignant reminder that we are ‘in the coal business’. So much so, in fact, that Queensland’s newly passed Mineral and Resources bill prohibits anyone not ‘directly affected’ from objecting to carbon-intensive mining proposals while also prohibiting all objections to so-called low-impact mining, effectively exempting some 90% of operations. Concerned citizens have effectively been legislated out of the conversation in an appalling attack on democracy. One can criticize the incumbent government for many things, but not for failing to cover all bases. A return to witch-hunts against environmental NGOs looms large on the horizon, with a number of organizations facing legal and financial ruin by the very government whose policy gaps they are working so hard to close. Recommendations to strip environmental NGOs of their ability to receive tax-deductible donations and the proposed repeal of the Australian Charities and Not-for-profit Commission (ACNC) are effectively moves to de-claw the climate movement, and ensure that business as usual proceeds without so much as a hiccup. So what can a climate movement with no backbone achieve? Historically, gaps in policy have been met with strong civil society action. 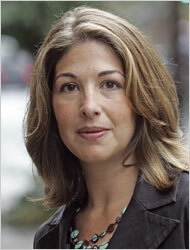 It’s time we rose to our historic moment, as Naomi Klein urges. ‘We the people’ need to reclaim the climate movement. While mainstream climate activists emphasize market-dependent initiatives such as divestment from fossil fuels, getting behind renewable energy, and putting in place carbon-pricing mechanisms, there are a handful of voices from the margins promoting alternative strategies, including the controversial and challenging measures of economic degrowth, and direct action. A few pariahs are even urging preparation for the tough times ahead. But these alternative voices are weak, drowned out by the mainstream mantras of ‘we’ve got to put a price on carbon’, ‘move your money!’, and ‘100% renewable for the win!’ What the climate needs right now is for transitioners, degrowthers, permaculturists, and other resilience-oriented folk to stop watching from the sidelines as the movement is declawed at best, and at worst, co-opted by spurious sales reps for greenwashed industry. So this weekend [20&21 September 2014] I won’t be marching for the climate. And I won’t be sitting around doing nothing either. I’ll be at the sixth annual Australian Climate Action Summit held this year in Queensland, our Sunshine State. And I’ll be delivering some inconvenient truths. My presentation on degrowth is my offering as an apostate from the churches of economic growth and techno-optimism. The climate movement needs to hear this – that the pursuit of perpetual growth is what got us into this mess, and that tech-fixes won’t get us out of it. We are going to have to make major changes to our way of life. A call to action for Australians to engage with opportunities and solutions, the Summit is also an invitation to debate which tactics will actually work to reduce our collective carbon footprint. Most transitioners, degrowthers and permies are just as guilty of groupthink and huddling together with like-minds, in my view, as the mainstream climate movement is. If we never emerge from our silos then what do we really stand to achieve? Preaching to the choir is a reassuring experience, well within the comfort zone, but it’s not going to get those inconvenient truths across to the movement in the tiny window of time we have available. We have to transcend comfort zones and network with unlike minds if we are to have a shot at making a real difference. And the more people we can work with, the better chance we’ll all have. I’m not alone in this view, thankfully. The climate movement’s pet projects receive plenty of scrutiny and critique from climate deniers and right-wing political pundits, but these are not the only folk who have questions, or challenges. The movement is not without its controversy, and the Summit is an excellent opportunity to law a few cards on the table and get talking about tactics that will really slash emissions. Consumer actions such as ethical investment and divestment from the fossil fuel industry are presented as simple, empowering moves that anyone can make. Money talks – and those who have the most are heard above all others, thanks to their well-paid lobbyists – so it makes sense to put your money where your mouth is. But divestment as a tactic is not without its critics, and questions need to be asked regarding how far it will get us, and how quickly it will get us there. The market forces of supply and demand hold sway, revealing two inconvenient truths: fossil fuel supply must be disrupted, and demand must be reduced or eliminated. The extent to which divestment can disrupt supply hinges upon how much money can be pulled out of the industry, while failure to impact demand renders divestment moot. An industry that is still profitable is vulnerable to share buy-outs at fire-sale prices by unscrupulous investors who stand to make a killing. The divestment debate is clearly one that needs to be teased out, and Sustainability Showcase’s David Zwolski will do just that at the Summit. The push for 100% renewable energy is a major aspect of the climate movement, touted as not only essential, but also entirely possible to achieve within a mere decade. Renewable energy lobby group Beyond Zero Emissions has achieved rock star status in the Australian climate movement with bold claims that 100% renewable energy is achievable, affordable, and can launch Australia to the status of renewable energy superpower. Too good to be true? Perhaps. The climate movement is not without its renewable energy skeptics, although they are generally considered apostates in the church of fossil-free energy. The skeptics have a point though. Renewable energy delivers low returns on energy invested, is dependent on fossil fuels for its implementation, and brings a series of environmental hazards of its own. Replacing one environmental disaster with another is an approach that would have many old-school environmental activists spinning in their graves. Radical environmental group Generation Alpha’s Ben Pennings may make himself less than popular at this year’s Climate Action Summit by calling into question the ecological viability of aiming for 100% renewable energy in lieu of slashing our energy requirements. He won’t be alone in doing so. Non-violent direct action is a controversial last resort in our most civilized of civil societies, but let’s not beat about the bush. Wins were inarguably achieved by the Suffragettes, the American Civil Rights movement, and Gandhi’s Indian independence movement, thanks to the willingness of a few brave activists to go a step beyond begging the powers that be to instigate change. Make no mistake: the suffragettes would not have won votes for women had they not taken direct action; they had no recourse through the electoral system. The Civil Rights movement would have achieved little if they’d waited for sympathetic white folks to recognize the rights of African-Americans. India would still be under the rule of the Raj had Gandhi opted for simply imploring the colonial overlords to play nice. Now that we have been stripped of our policy safety-nets and the right to even object to carbon-intensive mining projects, imploring politicians and polluters to maintain a safe climate threshold seems less than adequate. Generation Alpha’s call for extensive non-violent direct action tactics regarding Queensland’s Galilee basin could well come in handy. With the recent vindication of the 1970’s Limits to Growth study an even more inconvenient truth than climate change looms large. It’s not news to transitioners and degrowthers that we are set to hit hard limits in the not-too-distant future, relegating perpetual growth to the realm of fantasy. Apostates from the church of economic growth, Sustainability Showcase will explain, in no uncertain terms, that it is precisely our pursuit of infinite growth on this finite planet that is the cause of our climate change predicament. Mother Nature does not negotiate, so it is we who will have to change our ways. Reaching limits to growth poses a double-edged sword, however – one that can effectively slash our emissions, but also one that poses immense challenges for our economic future, and one that starkly defines techno-fixes as mere wishful thinking. This tough news will be inconvenient indeed for pro-growth true believers and techno-optimists. But one must ask: if we so readily accept what science tells us about climate change, then why is it so hard for us to accept what science tells us about limits to growth, the carrying capacity of our finite planet, and the ability of our biosphere to absorb all that we shock it with? This most interesting blog article from a Hobart City Council Alderman, Eva Ruzicka, explains why Council rates never go down, and how growth and, more to the point, incremental growth in the complexity of how governments at all levels no longer has any choice on how to run its day to day affairs, due to ever more stupid and unsustainable regulations. If you ever needed more proof that we have to live more simply so we may simply live……. look no further. And the other big question on the election trail…. If there is one thing that people get feisty about, it’s the rates bill. Why is it so high? Why does it never go down? And why do people try to get elected by saying they’ll vote for lower rates and then we never hear from them again once they’re occupying the comfy chairs around the Council table? I’m tempted to answer that you’re living in a Western capitalist economy predicated on growth and if you want the benefits you’ll have put up with paradigm of exponential increase. But I suspect that won’t win much in the way of plaudits, and it is a bit politically philosophical when you’re trying to put bread on the table and pay off the mortgage. What I can say is that historically, things might have been different if we’d elected accountants, rather than politicians. When elected people have avoided increasing rates or increased municipal debt, later generations have had to stump up. And this is the nub of it. You have to go back to where it all started, and for this, have a look at the history books. Tasmania (or Van Diemen’s Land as it was then) wasn’t settled for any economic reasons. It was settled to stop the French from taking possession. So there wasn’t any business case for the English government of the day to fund the prison camp from the Colonial Chest – other than just barely meeting the costs of running a dumping ground for the surplus population who tried to make a living any way they could outside the punitive property laws of the day. When word got out the island was highly suitable for farming and grazing, we had all sorts coming here to make a fortune by taking up the land from the Palawa/Pakana by force, and being subsidised with free land and convict labour. And when the Napoleonic Wars were finally ceased, guess what? England did the usual trick of saying, stand on your own two feet, we can’t afford to subsidise you anymore. So when Tasmania the colony did in 1856, it then got successive colonial governments that were excellent at running up large debts with overseas banks, but useless at providing the services a growing population demanded. Let a form of local government do it, they said. Albeit very reluctantly, because while the carrot of local control (for which read those land owners and magistrates who got to impose their ideas of moral behaviour on the free, convict and ex-convict population) was tempting, no money came with it. Sound familiar? Nonetheless, by the end of the century, there was a proliferation of Councils, Town Boards, Road Trusts, schools, cemeteries, various agricultural pest control boards, jetties, marine boards, libraries, water trusts, and so on. By the time the Colonial parliamentarian, Dr John McCall, got all the Mayors of the day into a room well away from the press to discuss the delicate matter of reform, there were over three hundred various types of authority that came under the wing of local government. You have to remember also that once was, most of the population of the island effectively lived, worked and died in the same locality, and rarely, if ever, left it. Local councils diversified to the extent their ratepayers wanted various services within their municipal boundaries – hence the diversity. And still there wasn’t sufficient money to go around because the Tasmanian population just wasn’t there. Reform was needed, and reform followed throughout the 20th century. Yet still, money is the nub of it. The 49 Councils existing up to 1993 relied on State and Federal funding to cover activities the ratebase could not. Years of not wanting to incur debt, or incurring debt without sufficient raising the rates, or simply just not raising the rates because it was politically unpopular, set the scene for more financial reforms in the noughties. And life got more complex too, with increased State and Federal legislation and improvements concerning water, sewerage, planning, building, plumbing, health, parks, recreation, roads and rubbish management. Anyone who said (and continues to say) amalgamation of Councils should lower rates is either ignorant of the changes in local government practice or just wishing out loud wistfully. As one recent example, take water and sewerage. Okay, so its operation was taken off local government just recently but it still owns the asset. Why? The big Councils were able to sort out their problems, but for smaller ones, provision of clean water and adequate sewerage was just beyond their financial ratebase ability, and neither could they reasonably service the level of debt needed to get the job done to the high level of health and safety legislation. It’s been argued that the problems of water and sewerage were being sorted out at the local government level, but for State parliamentarians, particularly some of those in the seat of Lyons and Braddon, progress weren’t fast enough when people flooded their offices with complaints over water alerts. Hence, TasWater’s accelerated program of water and sewerage reform outside of Hobart and Launceston today. And this isn’t to say we shouldn’t all have clean water and adequate sewerage – we should. But how it has been gone about is not exactly creating less cost to the consumer. Okay, now I start to sound like an accountant, but bear with me. Here’s a plain English example of how things have got more complex in the last 50 years. The people want a BBQ in the local park. Council either has the money to pay for building up front or it raises a loan to do it, say $2000 for a simply concrete slab, brick and steel plate BBQ, labour costs included, and some donated bricks and cement from the local businesses. And as people wanted to boil a billy to go with the sausages, a tap was provided that anyone could turn off and on. And a simple wood slab table and bench set were sat beside the BBQ. We’re talking about 20-50 years ago. The BBQ is built, and lots of families and their friends used it, especially in the summer months when everyone visited in the holidays. So many people from out of town in fact, that Council ends up cleaning the BBQ and making sure there is a wood supply because of the complaints about cleanliness and people using the park’s trees for the BBQ. Have to encourage the visitors – good for local business. And as the hole in the ozone layer got bigger and the Slip! Slop! Slap! campaign took hold, the local people asked for a cover shelter. And then for more chairs and tables for families to use, and they had to be under cover too. Eventually everyone uses the asset so much, it wears out and vandals have their way tagging the park furniture on bored winter afternoons, and for some reason, people keep nicking the tap fittings and firewood. So then the local people ask for an electric BBQ replacement. As Council neither has the up-front cash or wants to raise the full loan to do it, it works with the local community group to raise the funds and eventually makes up the shortfall with a grant sourced from the local parliamentarian who is due for re-election. The shortfall is added to the rates budget. Voila! A new BBQ with a renewed cover shelter and upgraded, vandal proof chairs and tables and shelters, and because we all wanted it to look good, some landscaping with trees and shrubs that provides wind shelter and a form of privacy between the tables of the many families now using the BBQ area. And the tap has been converted to an in ground sprinkler system, with a more secure drinks fountain with a dog bowl attached at the base. There is no longer worn out lawn under the tables but a lovely mulch soft-fall. New cost, say very little change out of $300,000, because of the grant, but actual bill of say $550,000. The community and the elected members all get to enjoy a celebratory community BBQ when the power is switched on and have their picture in the paper. Everyone’s happy, it’s a wonderful place and the older folks reminisce about using the last one when they were kids, and how they’d like to form the same sorts of memories for their grand-kids. The asset was built either with a loan that had to be repaid, as well as interest and charges, and/or rates that have to be raised. So the initial cost of $2000 may well have been more as interest rates shifted around or Councillors didn’t want to raise the rates that year to finally pay off the loan. The cost of cleaning and wood supply has to be added to the Council’s budget, as well as the increase in manpower needed to service the BBQ on a regular basis. No money was put aside for replacement for the BBQ, tables and chairs or the nicked taps, so when the new electric BBQ with the new park furniture was provided, no money was there to pay for it. A lot of Council officer time (time equals wages costs here) was spent designing the new asset, engaging with the local community and consulting about it, as well as the planning, building and plumbing costs and requirements. The cost of providing water from a vandal proof tap has to also be factored in, as today water has to be paid for, and there is the added cost of maintaining the new landscaping. And there was the officer time spent in trying to source the funds through the grant process, and reporting the whole shebang to the Council for discussion and, finally, a decision. In terms of asset management, there was no asset depreciation or replacement put aside for the old BBQ. Further, the cost of the new equipment was much, much higher as it had to meet Australian Standards requirements, let alone the fact that Councils now have to meet planning, building and plumbing rules just like everyone else. These are hidden costs no one really had to contend with in the past and now have become mainstream in local government practice because State and Federal governments demand it, and risk management decisions in the Courts have created them. So now the Council, under 21st century accounting rules, has to put money aside for replacement/depreciation, asset development and annual operating costs, and it has to meet various health and safety obligations and Australian Standards in replacing the old BBQ. This is the financial iceberg under the upfront cost of the BBQ. You not only have to pay for building, you also have to budget for maintenance, depreciation and replacement. All in all, while this is a somewhat potted explanation, it should explain why a rates bill continues to grow. So in answer to the questions, why are rates always rising? The real cost of local government is like a financial iceberg. At some time, the elected members are taken into a budget workshop and get to see the full horror of the finances as the iceberg of electoral promises rolls over. We get to see there’s more than just the tip. The real cost has become a hazard to political shipping when you least expect it. And so rates are raised, after careful noting of CPI, and a sounding of the electorate’s mood. In Hobart City Council, the Aldermen are fully aware of the finances, and get to find out the real costs and impacts. And that is why rates bills never get lower. The community demands more, it pays more. More complex local government processes cost more. We could cut the rates to zero, but at some stage, someone has pay for replacement of what we all use. If not you, then your children and grandchildren in a disproportionate amount if we won’t foot part of the bill today. We could cut the rates to zero, but would you then be satisfied with the loss of services? Carefully spent taxes bring civilisation – not political promises to cut rates. This article first appeared in Spirit of the Times, September 2013, written by Kari, aka The Overthinker……. NB….. the link above no longer works, and all the images that came with it have disappeared, and were therefore edited out by me. What springs to mind when you hear the word ‘sustainability’? Is it images of wind farms, earthships or permaculture gardens? Is it recycling, energy-saving lightbulbs or greenbags? Is it organic versus GMO? Is it to fly or not to fly? What is the question? Much of the sustainability movement is wrapped up in either so-called clean energy lobbying or piecemeal ethical consumption initiatives, causing them to compartmentalize the broader issue and lose sight of the wood for the trees. That’s not to say that people’s lifestyle changes aren’t helpful or worthy of merit in their own right. But these behaviours won’t normalize until – perhaps unless – something more fundamental changes. people are not subject to conditions that systematically undermine their capacity to meet their needs. In examining how our civilization is treating the Earth and our fellow Earthlings it is clear we are fundamentally unsustainable. We have extracted natural resources at far above the rate of renewal whilst pumping out wastes at far above the rate of absorption. We have degraded our water, air and soil, thus reducing the carrying capacity of our landbases. And we have subjected huge proportions of our populations to conditions that systematically undermine their capacity to meet their needs, effectively enslaving people in a vicious cycle from which there are few chances of escape, much less opportunities to engage as responsible global citizens. The Post Carbon Institute have gone a step further in outlining five axioms of sustainability that together form the bedrock of any sustainable system, if applied. The first axiom: Any society that continues to use critical resources unsustainably will collapse. An exception to this axiom would occur in the case of a society avoiding collapse by finding replacement resources. However, there are limits to the exception. In a finite world, the number of possible replacements is also finite. In this case it is not a matter of whether, but when, a society will collapse. Archaeologist Joseph Tainter demonstrated in his classic study The Collapse of Complex Societies that collapse is a frequent, if not universal fate of complex societies. Collapse results from declining returns on efforts to support increasing levels of complexity using energy harvested form the environment. In our example, the fossil energy that has enabled our current level of complexity is close to depleted, and we are experiencing diminishing returns on our financial and energy investments. We will not be able to sustain society’s current level of complexity for much longer. The second axiom: Population growth and/or growth in the rates of consumption of resources cannot be sustained. A mere 1% rate of population growth would result in a doubling of the Earth’s population in the space of 70 years. With this rate of increase, the Earth would need to sustain 13 billion humans by 2075, 26 billion by 2145, and so on. Our current rate of global population growth is higher than this, suggesting that we are heading for a crunch. The third axiom: To be sustainable, the use of renewable resources must proceed at a rate that is less than or equal to the rate of natural replenishment. Renewable resources include forests, fish stocks, and topsoil, to name a few examples. While all of these resources are fully renewable, they replenish at a certain rate that cannot support the level of usage our society demands. Hence we are overexploiting renewable resources at far beyond the rate of renewal, thus rendering these resources effectively non-renewable. The fourth axiom: To be sustainable, the use of non-renewable resources must proceed at a rate that is declining, and the rate of decline must be greater than or equal to the rate of depletion, which is calculated as the amount extracted during a particular time period as a percentage of the remainder. Sadly we are doing precisely the opposite of this, with our growing populations and increasing affluence placing demands on the system. Purchasing power, not availability, determines “production” for the time being, and we have become unused to being constrained by scarcity. It will not be too long until we experience what unavailability looks like. The fifth axiom: Sustainability requires that substances introduced into the environment from human activities be minimized and rendered harmless to biosphere functions. In cases where pollution from the extraction and consumption of non-renewable resources has proceeded at expanding rates for some time and threatens the viability of ecosystems, reduction in the rates of extraction and consumption of those resources may need to occur at a rate greater than the rate of depletion. Humanity’s ecological footprint is, at present, 40% larger than the earth can sustain through regeneration. This is, by definition, unsustainable, and if we do not address the issue ourselves then Mother Nature will take matters into her own hands, restoring to balance that which we have unbalanced. “Earth Overshoot Day” falls earlier and earlier each year, demonstrating quite plainly that we are doing precisely the opposite of what we need to be doing. This year’s Earth Overshoot Day fell on August 20th, while 10 years ago it was on September 22nd, and 20 years ago it was on October 21st. It seems that much of what we refer to as “sustainable” is far from it. So-called ethical consumption partakes of the globalized industrial economy in most cases, perhaps slowing the rate of resource depletion and destruction slightly, but by no means getting off the carousel. Money is the motivator of any business, and to limit production to only what is necessary is anathema to profit. With resources finite as they are, we are all going to have to consider quantity as well as quality: we are going to have to want less stuff, locally produced stuff, not just greener stuff. Proponents of Big Green Tech claim that sustainability can be achieved by installing large-scale hi-tech “renewable” energy production infrastructure. While it is true that so-called renewable energy sources emit significantly less greenhouse gases and other pollutants than fossil fuels, they are hardly a panacea, and are far from being ecologically neutral, if we are to accept axiom five. They are also far from renewable, if we are to accept axioms three and four. All energy sources require infrastructure, all requiring the use of finite resources. Concrete and steel rebar are essential components of wind farms and hydro dams, and these, aside from being finite, have a hefty impact on the environment in terms of their production. Rare earth metals used in wind turbines, such as neodymium and dysprosium, and in solar panels, such as yttrium, are complicated to extract from the Earth as they are found dispersed in small deposits, and their extraction is anything but environmentally friendly, pumping toxic wastes into the environment in a manner no better than fracking or conventional mining. Make no mistake: a carbon-free world is not a toxin-free world, and we are poisoning the world – our air, water and soils – with or without fossil energy. The water footprint of “renewable” energy is also something we should be concerned about. Solar farms require water, usually groundwater, for washing mirrors, replenishing feedwater, and cooling auxiliary equipment. Geothermal power plants are failing to allow for the replenishment of groundwater supplies at the rate of depletion, with some projects peaked and running out of steam. Hydropower dams have the nasty propensity to hoard sediment, thus killing river life – a knock-on effect being loss of riverine biodiversity. The production of biomass requires extensive irrigation in many parts of the world, and this is already leading to depleted water sources and insufficient water (and land) for food-based agriculture. usurpation of food sources, which will undoubtedly hit the third world hardest as the world’s wealthy minority continue to make demands on the world’s ever-scarcer resources while the poor starve. According to science writer Dawn Stover, meeting the world’s increasing energy demands with renewable energy alone may prove impossible. To meet our projected demands in 2030 it is estimated that we would need 3.8 million wind turbines (each with twice the capacity of today’s largest machines), 720,000 wave devices, 5,350 geothermal plants, 900 hydroelectric plants, 490,000 tidal turbines, 1.7 billion rooftop photovoltaic systems, 40,000 solar photovoltaic plants, and 49,000 concentrated solar thermal systems. We cannot be so sure of a global renewable energy future with this demand on our rare earth metal deposits, groundwater, and limited available land. Interestingly mainstream sustainability advocates do not mention approaches such as downshifting, eating fewer (or no) animal products, re-wilding domesticated tracts of nature, and localizing our resource production and consumption. Consuming less and more modestly, and eating in accordance with the constraints of our local landbases isn’t as appealing as being able to continue with business as usual pending the wave of a magic wand that establishes boundless renewable energy. It is also not an approach much advocated by proponents of our growth economy, which few of us even think to question. With the emphasis on ethical consumption and Big Green Tech one could be forgiven for thinking we want to have our cake and eat it too. We don’t want to destroy our environment, you see, but we would really love to be able to keep all of the shiny toys and gadgets that we’ve become so attached to. Our efforts toward sustainability have been largely focused on sustaining our way of life, rather than sustaining nature in a way that makes any life at all possible. Apparently the term sustainability, as used by many advocates, does not mean defending the nonhuman world from the expanding empire of homo sapiens; it means sustaining one particular human civilization in the manner to which we have become accustomed. So often we put our faith in techno-fixes. We trust that salvation will appear in the form of a distant and magical technological advance that will unpick the damage we have done and set us straight on course to sustainability – without us ever having to alter our own lifestyles. We conflate needs with wants, rationalizing our desires for the latest iCrap with a confused expression of “need” in lieu of “desire”, and perpetuating a paradigm of escalating consumption and depletion. It is as though we simply do not understand that one day things will run out, and we will be forced to embrace simplicity. It seems we will not go voluntarily, and the few that do are not viewed as the positive role-models that they are, instead portrayed as fringe radicals who want to return us all to the Stone Age. So we turn away from the bigger picture, and look only at what can be tweaked with little or no adaptation required. Our reductionist mentality leads us to compartmentalize our problems and reach obvious conclusions that do not necessarily solve them. For example, if we understand that carbon emissions are a problem, then going “zero carbon” is clearly the solution. So long as we can build enough of the right kind of technologies to generate the power we “need” without producing CO2 then we’ll be fine – we’ll never need to downshift our consumption or alter the foundations of our economic system. In precisely this way many so-called sustainability advocates have reduced the entire notion of sustainability down to a single component, usually carbon, and treat the matter as an engineering challenge alone. We fail to think integratively about the whole issue, addressing components in a linear manner, completely blinded to the holistic picture we need to see. If we are to sustain our planet, and any chance we have of any way of life at all, we are going to have to come to terms with the fact that Mother Nature doesn’t negotiate, and that her rules are already mapped out. We are not at liberty to break them. As it is, our species has, in the words of Stephanie Mills, “deforested, plowed, bulldozed, dredged, drained, dammed, polluted, or paved one-half to one-third of the land surface of Earth.” According to the United Nations’ Millennium Ecosystem Assessment, “The structure and function of the world’s ecosystems changed more rapidly in the second half of the twentieth century than at any time in human history,” which has resulted in a “substantial and largely irreversible loss in the diversity of life on Earth.” Clearly this is a trajectory that cannot continue. But what are we doing to stop it? Changing our lightbulbs, recycling more, and eschewing plastic bags? Waiting for a Big Green Tech revolution? We need a more fundamental change. We need to downshift, we need to live localized lives, we need to live fully in accordance with the limitations of our landbases, we need to take the five axioms of sustainability as seriously as the laws of thermodynamics, for they are unshakeable dictates that we have no power to alter. It is unlikely that we will be able to combat issues such as climate change as long as we are able to unlock carbon and pump it into the atmosphere. The reality is that people want to continue using the fruits of carbon’s labour more than they want to save the world, and renewables technology isn’t capable of delivering the same. We are far too removed from the effects of our actions and desires, living in a technological bubble that separates us from nature and obscures our view of its destruction. Until – or unless – we are threatened directly (and that does not include threats to those in the third world, for they are not the global decision-makers), we are unlikely to take action to reverse our trajectory. We need to grow up. We need to learn that we cannot have our cake and eat it. We need to move away from an anthropocentric worldview that places humans at the centre, with the world our playground to do with as we wish. We are not the chosen ones, there is no promised land, and we do not have dominion over nature. Ultimately, sustaining this system that we have grown to depend on is not worth it. The only thing that is worth sustaining is that which sustains life itself, not just a way of life.